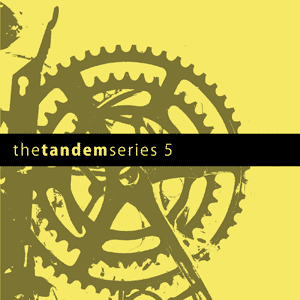 The fifth in this series of split CD releases on Boltfish Recordings, showcasing tracks from two like-minded artists. U.S based Milieu and Polish born ENV(itre), two hugely talented artists, deliver 9 tracks of blistering electronica. "Milieu's exudes an understated ambient hip-hop vibe that merges woozy Boards of Canada-styled psychedelia with downtempo beats—the ideal soundtrack for making it through that groggy Sunday morning. Though the six tracks are all decent, the heavier plod of "Charcoal" makes a strong impression while the clusters of warm synth figures in "Schoolbells" sparkle effervescently. ENV(itre)'s evocative material offers a natural complement to Milieu's though Majewski's tracks occasionally veer into grimier territory. "Oaetometq," for instance, comes closer to machine-oriented funk than hip-hop, with assorted clangs peppering its burbling funk rhythms. His four tracks show a wide range, as evidenced by the darkly dramatic "Salecareal" and the dreamy oasis "Loyr vacn." "
"Five compilations in and Boltfish's Tandem series has still yet to produce even an average record. Here they match up South Carolina resident Milieu with Polish-born ENV(itre). It doesn't take a wild guess to work out who Milieu's influences are. The spacey beats and eerie atmospheres are pure Boards Of Canada. Interestingly, the man behind the music, Brian Grainger, started making music after his parents' divorce, which probably goes some way to explaining the melancholic nature of these instrumentals. Meanwhile, ENV(itre) AKA Miroslaw Majewski composes his music entirely from edited sampled sounds. Majewski defies this self-imposed restriction by creating a quartet of sadness-infused melodies that actually fit in rather well with Milieu's oeuvre. The fine material here is only marred by the impression that the two acts are in a genre where there are so many other similar-sounding artists." "..Milieu contributes with five tracks saturated with early BOAC references and who can ever really be blamed for having that particular source of inspiration? Milieu’s part starts off with "Threw Ourselves Into The Sun" a lovely track with a healthy beat and a dose of nostalgia. "Rain Metre" progresses along the same line, slowly and well put together. "Saltwater" strikes up a slightly more sinister atmosphere and has dry forward moving beats and interesting sounds, homage to BOAC of sorts. "Charcoal" is just so beautiful, with massive bass, echoing powerful beats, lovely melody all drenched in sprinkles of glitch and disturbing distortions it’s most definitely my favourite among Milieu’s tracks. Back on track in "Schoolbells" with straightforward beats ending this part of the debut release on Boltfish. The other artist contributing to this split goes by the name of Env(itre) and sees the welcome return of a talented electronic musician. Env(itre)’s debut full-length album entitled "Teaktshramin" was reviewed here at ED some two years ago (2004) and was originally released in 2003 on a German label called Aphorism. The whereabouts of the Aphorism label are not known and it would seem to be another small label that subsumes to the harsh (economic) reality of independent micro music life. The four tracks by Env(itre) are all really good and they all dwell in a crisp and clear musical setting; containing healthy doses of beats, bas, structure fused with atmospheric elements cementing the feeling of enjoyment and very much a Boltfish affair. It’s Boltfish’s new breed on BOLT032 and you know you should investigate." "The duo of Milieu and ENV(itre) deliver a fine, fine selection of beautiful electronic music here. Split, once again, into 5 and 4 tracks respectively, each artist has a lovely grasp of mellow, downbeat Electronica with plenty of melody and nicely refined sense of rhythmic programming. From Milieu's slightly more breakbeat driven beats to the clicked-out and processed sounds of ENV(itra) it's clear these guys know what they're doing. A summery, chilled-out feeling pervades and, if you know what's good for you, you'll snap up this limited release if you've got any interest in great quality electronic music. Superb." "A quite spiffing release all said and done that pairs together the contrasting aural worlds of South Carolina based Millieu and Polish born now Germany based env(itre). We can think of no better way to chill away the early hours of the day than to the silken milky sounds of Millieu or Brian Grainger as he’s better known to kith n kin. Seems Mr Grainger has been peppering the more clued in disciples of electronica for a fair few years now with releases appearing on both Infraction and U-cover. This split features five more slices of amorphous ambient delights from the Millieu locker. Misty eyed nostalgic test card melodies succulently threaded with spacey serenades that sound like they’ve escaped a child’s bedroom to idle away summer nights bathing beneath far flung lunar moons. Employing textures and a sound base more in common with those early electronic releases via Warp, Grainger carves out gentle on the ear morsels of shy like delicately dreamy ambient pop, ’Threw ourselves into the sun’ orbits some hitherto invisible plain, a chorus procession of redundant ice cream vans chime into the ether their trippy though vibrantly earthly montages whilst being orchestrated by a troop of Clangers who’ve taken a wrong turn home after a night on the sauce. The starry eyed ’Rain Metre’ - lone, enigmatic and majestic, this tear jerking nugget has you imagining the essence of Harold Faltermeyer being bottled into an ornamental snow globe and teleported across the cosmos while ’Saltwater’ sweetly seduces you with its lightly tip toeing lullaby-esque charm as though its just tumbled out from the nursery playroom of the BBC Radiophonic Workshop. The cavernous sounding ’Charcoal’ provides the set with its most measured cut comprising intricately layered textures the childlike soothing melodies are replaced by a more robust mindset that mooches ominously amid noire-ish backdrops filtered by snaking beats and endowing throughout a heart wrenching unbound sense of deep regret to its matrix while the hypnotic lull of ’Schoolbells’ which neatly wraps the occasion is peppered with a subtle spectral sensuality that’ll simply floor you with irresistible delight. 26 year old Miroslaw Majewski or env(itre) as he’s better known to the electronica fraternity has been doodling in his workshop for nearly 10 years now having scored releases for Aphorism as well as appearances via Sutemos, Databloem and Neo Ouija while not forgetting to mention outings for the net label Tonatom where to date he’s released no fewer than three full lengths into the cyber community the latest just posted being ‘Weirdwire’ which we’ve just had a peak of and heartily recommend you snare yourself a copy to call your own. Majewski’s side of the split release features four tenderised slices of numbing ambience that opens with the dreamy ‘Salacareal’. More svelte starry eyed incantations from the whirly pop world of electronica, this lonesome sounding honey belies a deeply resonating Carpenter-esque widescreen spy / suspense thematic thread that’s lightly sugared by a sweetly seductive lunatic cortege of voiced keys that playfully pirouette and purr into the neon lit voids of night skies which sharply and superbly contrasts with the hollowed distant ache afforded by the sparsely shy eyed ‘Oaetometq’ itself cut and crafted to share the same oblique mindset as those early EU and latter career Lamdshipping releases. The glacial swathes of wave like monolithic sweeps that bathe the flawlessly lulling ‘Loyr Vacn’ - all the time braided by a wealth of spongy clicks and gently cantering keys - converge to comes across like an updated variant of the Home Services ’Shipping Forecast’ while best till last the beauty that unfolds throughout the duration of the lushly arresting ’Cipramil’ may well have many of you thinking that the Brontean elegance of FortDax had been usurped, recalibrated and impishly twiddled by the crafted handiwork of those lovable rogues d_rradio. A thoroughly recommended split release."